Charcoal Drawing, preliminary drawing for Sky's the Limit oil in the Water Portfolio, part of the Women Painting Women series for my book Project “Book of Water – (A Series of Portraits painted in, on and around Water), the idea of the oil painting being; to capture the way it feels to see that big blue sky, on a clear day when you feel like there are no boundaries on what you can do. Sold unframed. Categories: Charcoal Drawings, original drawings by Deborah Chapin, Originals. 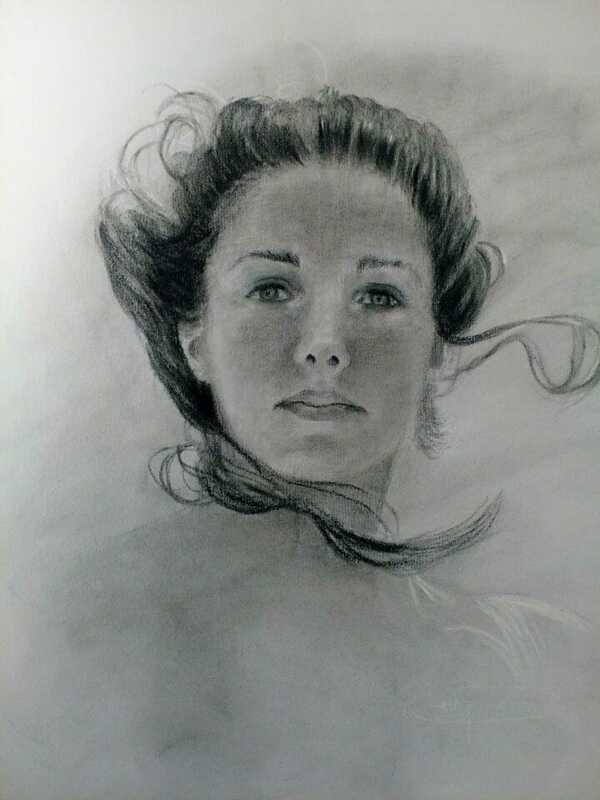 Charcoal Drawing, preliminary drawing for part of the Women Painting Women series for my book Project Book of Water – (A Series of Portraits painted in, on and around water, the idea of the oil painting being; to capture the way it feels to see that big blue sky, on a clear day when you feel like there are no boundaries on what you can do. Sold unframed. I have painted every subject known to woman at this point, starting with marine art, coastals, seascapes, florals and landscapes en plein air (on location) I am now branching out to portraits and figurative work and add it to my skills and eventually incorporate it into my seascapes. I am excited to see where it goes and how it evolves. Currently I am taking on a project of underwater portrait paintings and figure work. I began this portfolio with the economic downturn because the expense and personal considerations made travel impossible. I have been painting water in all its various forms and moods for 35 years and this subject matter appealed to me because it combined something I knew well with something I was just beginning to learn. The objective wasn’t to do a photo realistic painting but rather to capture the essence of the subject and the spirit of the model. Water often represents the border between this world and the next but that need not be the dark side of that connotation and to my mind it is uplifting and full of life and movement. I am seeking to depict the inside dynamic of an individual using water to carry light and movement through the subject. What I’m trying to depict is the spirit of women, not as the languid object but instead as a dynamic, spirited, strong and intellectually thoughtful individual. Water is a freeing medium, releasing the subject from the constraints of the ordinary and from gravity it also doesn’t allow for “the pose” with the difficulty of control comes movement and life into the depiction and a certain serendipity which I have always found to be an inspiration. I use the natural light because again it the opposite of the darkness it represents life and vitality and enhances the strength of light patterns and movement lines.